Friday may well mark the single most important day in the political career of North Carolina’s junior senator Thom Tillis. That’s the day that U.S. Senate Republicans have indicated they intend to have the Senate Judiciary Committee vote on the nomination of Brett Kavanaugh to serve a lifetime appointment on the U.S. Supreme Court. The announcement of the planned vote comes, remarkably, despite the fact that the committee is also scheduled to hear that very same day from one of two women who have come forward to accuse Kavanaugh of what amount to sexual assaults when he was a young man. By every indication, it appears that Senate Republicans will, without even seriously considering the testimony of Dr. Christine Blasey Ford, dismiss her claims, ignore widespread calls for a full investigation and move rapidly forward to place Kavanaugh on the Court. If this, in fact, the case, it is hard to overstate what a treacherous, immoral and Machiavellian move it will constitute. Of course, merely to vote on the nomination is not to approve it. Confirmation will require “yes” votes from all 11 Republicans on the committee — a group that includes Mr. Tillis. If any Republican votes “no,” the nomination will fail in committee. The implications for Tillis’s political career are, of course, significant. If he summons his inner manhood and defies Republican leaders, he’ll undoubtedly face a far right primary opponent in 2020 (though that eventuality may already be likely). If, on the other hand, he meekly shuffles along with the GOP pack, he will hand any Democratic challenger a huge and powerful issue with which to attack and defeat him. But, of course, the truly important thing here is not Tillis’s career. Rather, it is our country’s future and whether it can find a way out of the dark tunnel of corruption, racism, misogyny and lawlessness that are the hallmarks of the Trump presidency. Throughout his career, Thom Tillis has attempted to portray himself as an arch-conservative, but not an unreasonable ideologue. And on occasion — with respect to immigrants, some aspects of Trump corruption and, recently, climate change — Tillis has, at least partially, lived up to this claim and shown himself to be willing to do and say the right thing, even if it means defying the far Right. This Friday, however, will provide an acid test that will quickly overshadow his stances on any of those other issues. If he says “no” to rushing Kavanaugh through, he will reveal himself to be a man of some measure of principle and validate his past claims to being an independent thinker and leader. It will be an act by which he will be long remembered. If, however, he meekly assents to the GOP power play, all those claims of independence will be revealed to be a fraud. He will, instead, be remembered as a loyal party hack and a politician who cared more about his own career than truth and justice. Well written post concerning Tillis, Rob. A fair statement in clearly identifying how much of an “independent” Tillis really is as he represents NC in the US Senate. Let him know WE ARE WATCHING. Doing the right thing is neither political expediency nor betrayal. It is simply doing the right thing. Tillis just did the right thing with his personal minutes in the hearing. The Republicans are clarifying this afternoon how the Democrats botched the opportunity to investigate Dr Ford’s allegations in a timely fashion. Today’s Lesson yet to be learned by Democrats: the Senate Judiciary Committee IS THE BODY RESPONSIBLE FOR INVESTIGATING allegations against a judicial nominee. 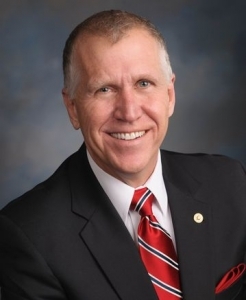 Great job senator Tillis! I’m very proud to be a Republican tonight, and proud of you as my senator. As usual, you laid it out clearly and consistently. Kavanaugh should be confirmed.